Police have released a video and are appealling for witnesses after a teenage girl was kidnapped in Milton Keynes. Now police have released this video in connection with the incident. A teenage girl walking under an underpass in Bletcham Way was snatched and held for more than three hours last week, before being found in a layby in Bedfordshire. Police in Milton Keynes have today appealed for witnesses following the kidnap which happened last Thursday (November 15) at 3.40pm. The victim, a 14-year-old girl, was walking in an underpass in Bletcham Way, which leads from the Power League AstroTurfs into Browns Wood when she was pulled into a parked dark blue van by a man in Elgar Grove. 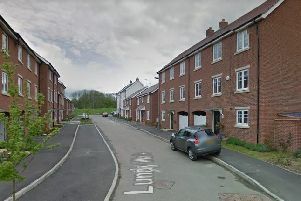 There were sightings of the girl walking in Watling Street, Fenny Stratford, at 4.20pm and on a footpath outside Hunters Farm, walking in the direction of Little Brickhill at 4.35pm. The girl was located at 7pm in a layby of the A5 near the Flying Fox public house in Sheep Lane, Potsgrove, Bedfordshire. The offender is described as white, and had a flesh tunnel earring in one ear. He was wearing a black beanie-style hat, grey trousers and a grey top.